Focolare.org report: There was nothing extraordinary or unusual about the life of Chiara Badano (known as Chiara Luce). And yet for this girl who loved swimming, skiing, listening to music and being with friends, God was always present, beginning with her birth for which Ruggero and Maria Teresa Badano had been praying for eleven years. Then, to their surprise, it happened and Chiara was born on 29 October 1971 in Sassello, in the inlands of Savona, Italy. When she was seventeen years old, while playing tennis, she felt a stabbing pain in the shoulder. Soon afterwards she made the tragic discovery: osteosarcoma, one of the most ruthless forms of tumour. Finally, on 7 October 1990, her “departure”. One last smile for Ruggero and then a goodbye for Maria Teresa: “Mamma, be happy, because I’m happy!” There was a huge crowd at the funeral and, as she had requested, Chiara Luce was buried in a white dress, “like a bride going to Jesus”. Shortly before dying, Chiara Luce exclaimed: “The youth are the future. I can no longer run, but I’d like to pass the Olympic torch on to them. 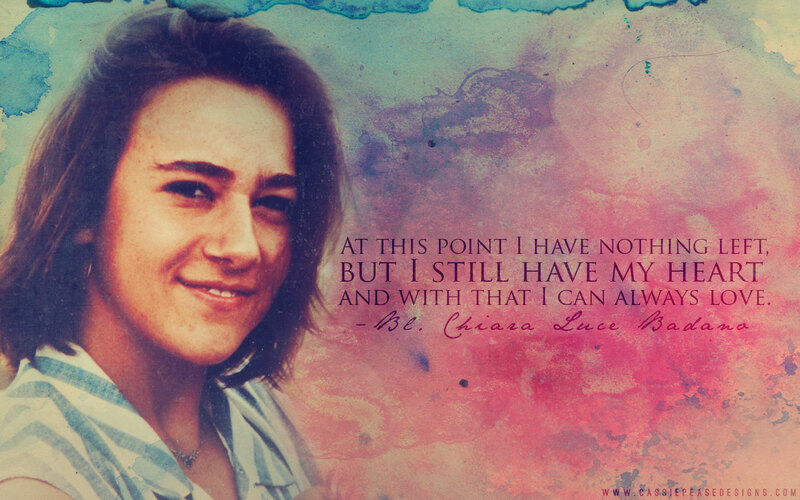 The young people have only one life and it’s worth it to spend it well!” The 25,000 young people who attended her beatification ceremony in Rome on 25 September 2010, demonstrate that Chiara Luce Badano has given witness to a model of holiness that can be lived by everyone!